About a week ago, a customer called wanting to know what books I had that would help girls prepare sewn items their hopechests. When she received the book, Hope Chest Legacy, she was SO thrilled with the contents of this book that she called us to tell me what a terrific book it is. "For several years, I've been amazed at the lack of basic homemaking skills in many young ladies and young mothers all around me. In an attempt to be a part of the solution, I held several sewing classes in my home, teaching young ladies sewing, embroidery stitches, and how to use a sewing machine, in the hopes that they will pass the skills on to the next generation. More recently, I invited several of my daughter's friends to my home to not only socialize every other week, but to do something productive at the same time, developing skills while preparing for the future. We decided to form The Hope Chest Society. We are working on items that can be put in each of the young ladies' hope chests. We wanted a few more ideas for what activities we needed to include and that's when I discovered Rebekah Wilson's book, "The Hope Chest." This 370-page book was exactly what I was looking for. It is full of information and ideas, some that I'd thought of already, and many others that inspired me to do more with not only my own daughter, but with other girls whose lives I could influence. If you have desired to do something special for and with your daughter that will last a lifetime, this book will give you a clear guide on how to do it, yet give you the flexibility to customize it for your own family. It's an absolutely wonderful book! "I have six girls in my group. One of my friends loved the idea and now has eight girls in her group. Another friend is desiring to begin a group with her girls and their friends. The hope chest idea is spreading in our area and the mothers are rallying around the girls, ready to teach the skills they have. I never cease to be amazed at how God can take a little seed (idea) and make it grow for His glory! My family and I have been so blessed by Hope Chest Legacy that I wanted to update readers with author, Rebekah's vision, for future HOPE CHEST SERIES Books. The dream of Hope Chest Legacy started in 1999 when Rebekah Wilson saw an advertisement for hope chests that reflected only a materialistic aspect. Rebekah realized many people consider a hope chest as only a physical box to hold items until marriage, and then the chest is forgotten. Knowing firsthand what a treasure and blessing a hope chest should and can be, Rebekah and her husband Edward started Hope Chest Legacy to encourage and bless families worldwide. It is the vision of Hope Chest Legacy to teach, encourage, instill and delight families as they go back to their roots - as far back as Biblical days - and begin setting up a hope chest for their children. Although the materialistic thought regarding hope chests is accurate to some extent, it is only semi-complete. The reality is that a hope chest is timeless. Each chest is unique and reflects the heart of the owner. A hope chest may begin by holding items for a future home, but over the years each chest also finds fond memories, family heirlooms, childhood treasures, and dreams of the future carefully tucked away - whether those dreams are from a young girl preparing for marriage and motherhood, or whether they are from a mother or grandmother who would like to preserve a legacy for their grandchildren and great-grandchildren. Rebekah has written several books about how to begin a hope chest. She believes a gentle and easy approach should be taken regarding the hope chest and any skills that can or should be learned to enhance the chest and the person themselves. Rebekah has written "The Hope Chest: A Legacy of Love" and is currently writing a 12 book children's series for girls entitled "GRANDMOTHER'S HOPE CHEST". 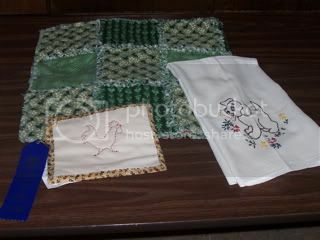 The below picture shows THE RUNNING ROOSTER the first project in the Grandmother's Hope Chest books. Hope Chest Legacy' WEBSITE offers Antique embroidery patterns , beautiful recipe cards and boxes, kits to complement the Grandmother's book series, information on building a physical hope chest, heirloom recipes, handsewing skills, free online patterns, and lots of encouragement and delight! The Wilson's have only just begun and their vision includes plans to have many more unique and special items available for hope chests and families, including hope chest kits, a handsewing lesson book, linens and sewing supplies, woodworking projects and a woodworking lesson book for boy,s among a variety of rare, unusual and practical items that will become available next year. With Christmas around the corner, may I encourage you to invest in this book and the vision of a Hope Chest?